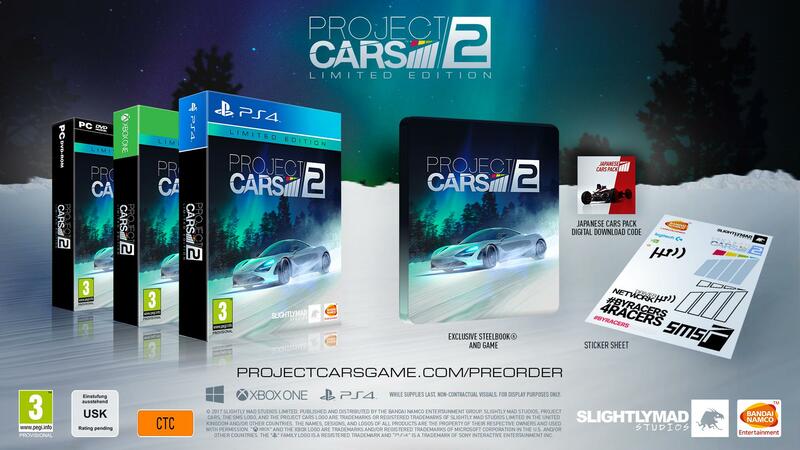 Project Cars 2 offers a number of different editions, depending on how many extra in-game and out-of-game items you want. 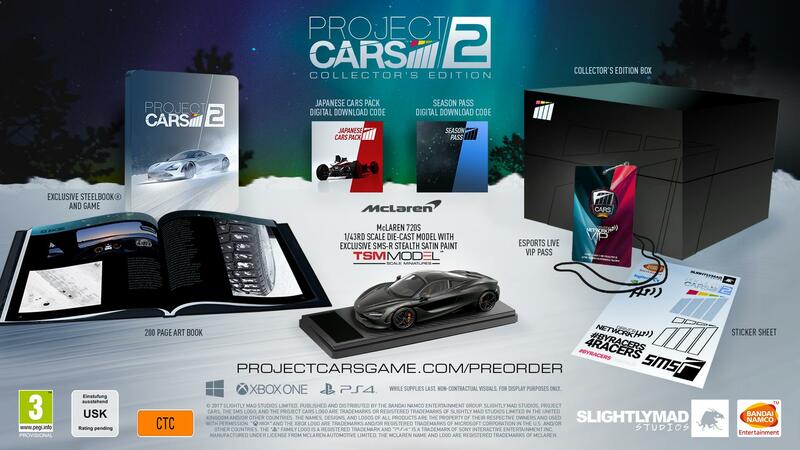 Namco, and Slightly Mad have announced that pre-orders are now open for Project Cars 2, and revealed three different limited editions. To start with, apart from the standard edition, a Limited Edition will be available only through GAME in the UK, priced the same as the standard one. This version includes a sticker sheet, a Steelbook case, and the Japanese Car Pack. This add-on comes with four cars from Nissan, and Honda. Two of which will be race cars, one is a road car, and the fourth is a concept car. 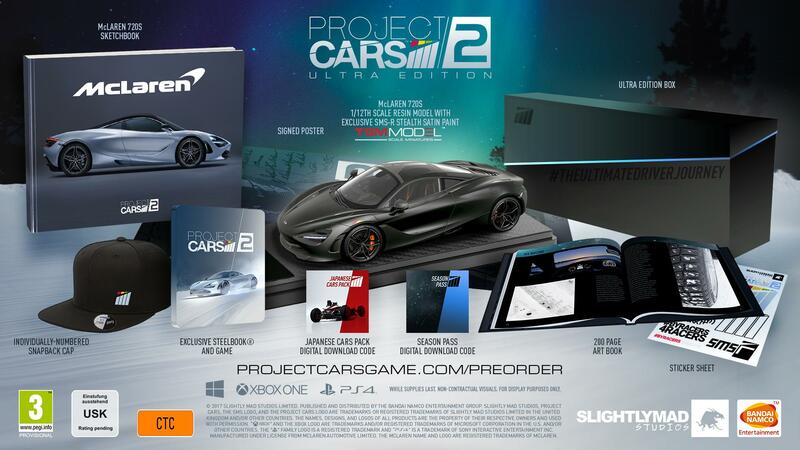 Then we have the Collector’s Edition, which comes with everything included in the Limited Edition, alongside the Esport Live VIP Pass, art book, a 1/43 scale model of the McLaren 720S with the Stealth Satin livery, the game’s season pass, and the Motorsport Pack. The Esport Live VIP pass is a pass that gets you full benefits at Project Cars eSports live events. Present it to Slightly Mad or Namco staff and you’ll get to meet the team, priority in queues, and the occasional free stuff. Finally, we have an even more packed version in the Ultra Edition. Available only at Amazon, this one is limited to 1,000 copies, and includes all content from the Collector’s Edition, with one exception. The 1/43 scale model McLaren 720S is replaced with a 1/12 Resin McLaren 720S model, also in Stealth Satin livery. Also included in the Ultra Edition is a signed poster, an individually-numbered Snapback cap, and a McLaren Sketchbook created in partnership with McLaren. This book chronicles the development of the 720S from inception, through design and engineering. All three versions are also available on PC. In celebration, Slightly Mad released an in-game look at the star of the show, the McLaren 720S. You can watch it above. Project Cars 2 is out later this year on PC, PS4, and Xbox One.